Presenting a Victorian off white light weight sheer batiste cotton tea gown garden summer dress dating to the late 19thc early 1900's. 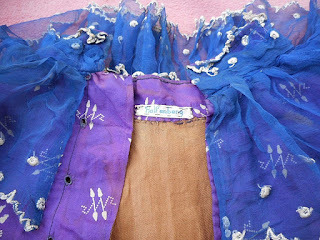 One piece in construction. 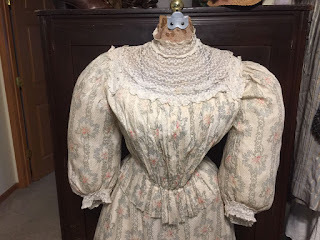 collar, stays in bodice, pintucks galore on sleeves and neck. The front bodice has a off white light ecru machine embroidered lace front that extends down skirt front center to the hem line. 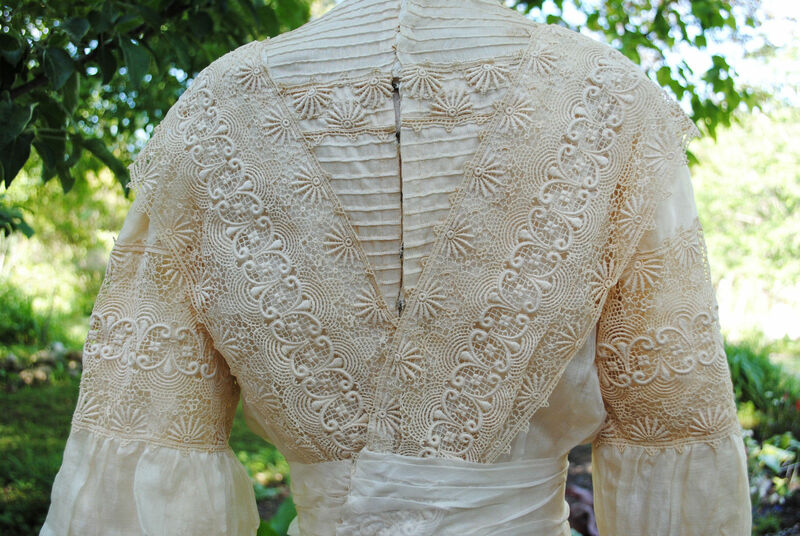 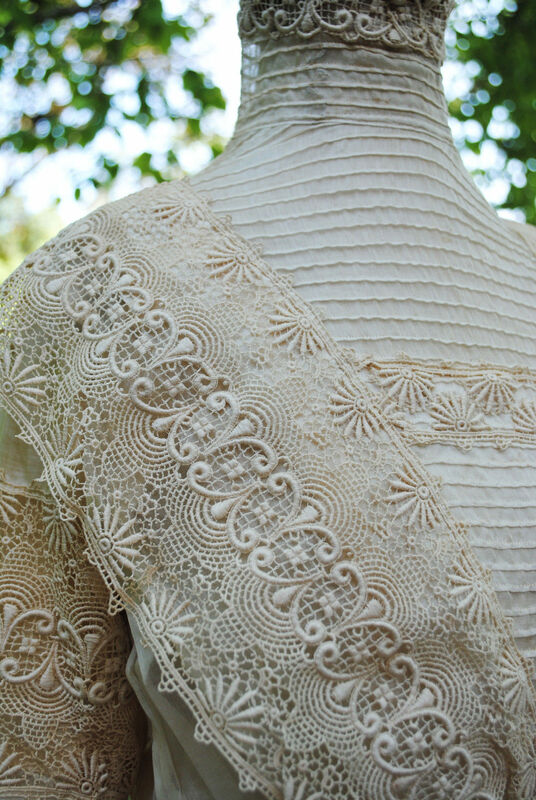 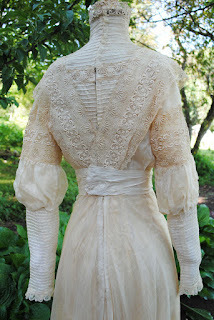 with long curved lace sleeves. 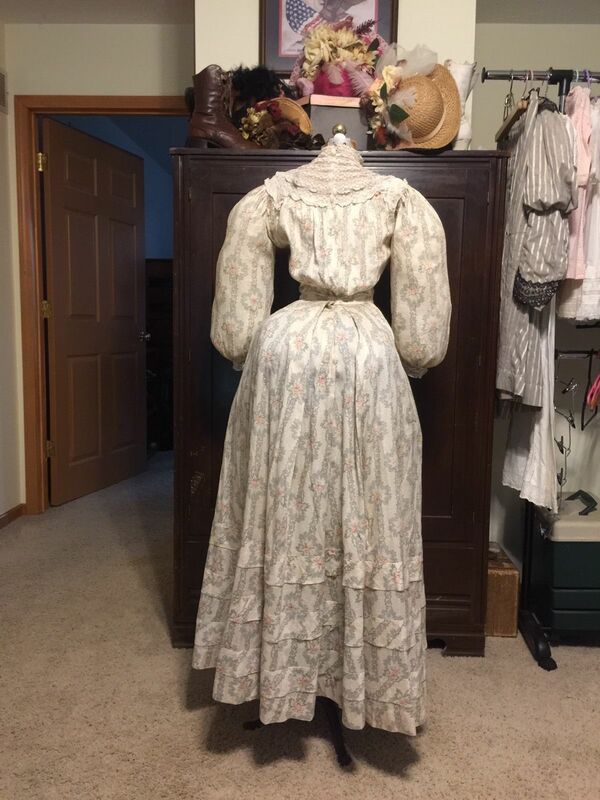 Accented at waist with 2 large rosettes. The bodice back has a extensive hook/eye closure. 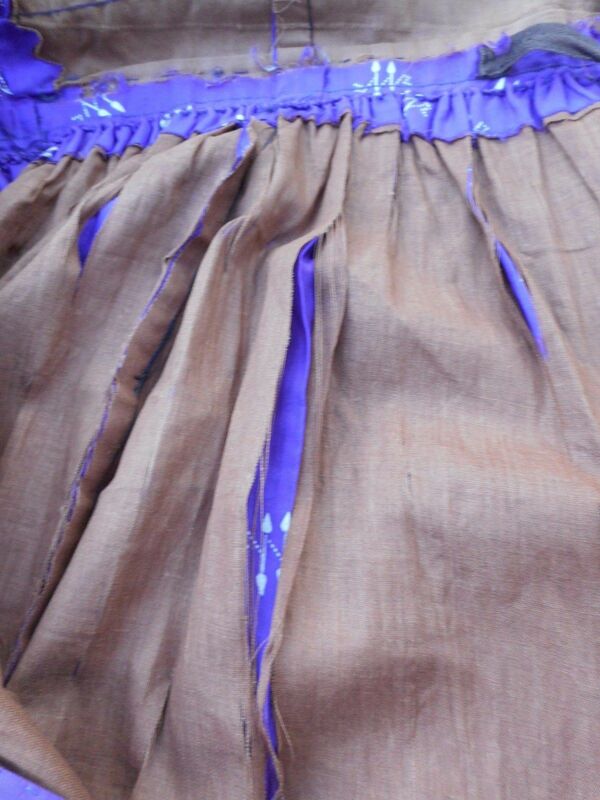 Skirt has hook and eye closure at back. 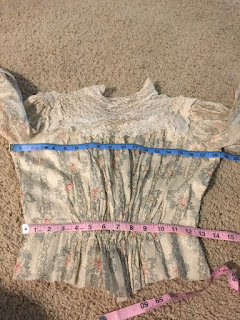 Dress has a full silk lining that has shredded. 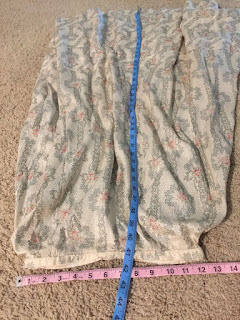 Skirt has a small train in back. 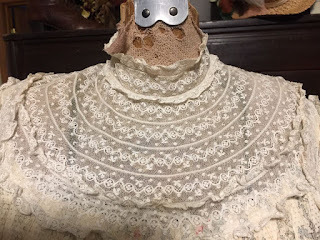 Condition: In good antique condition with age related flaws. 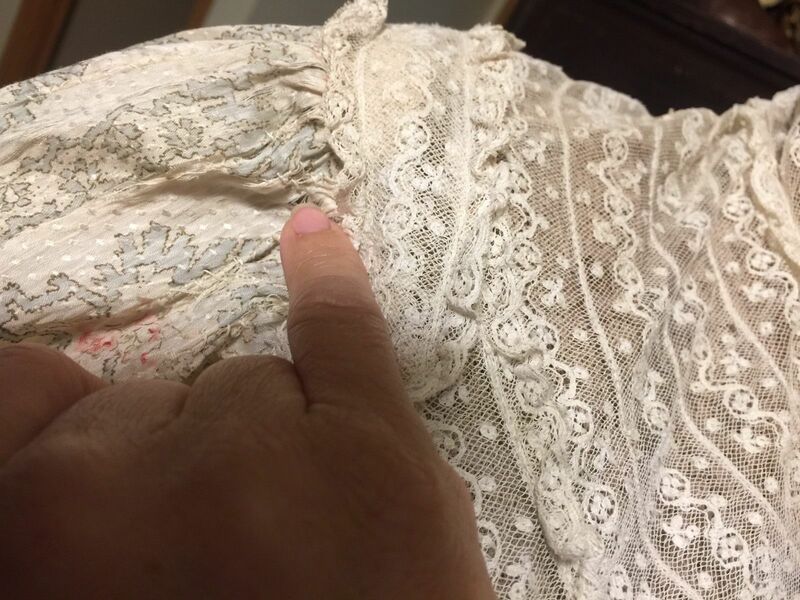 Small oxidation storage spot in front of dress by rosettes. 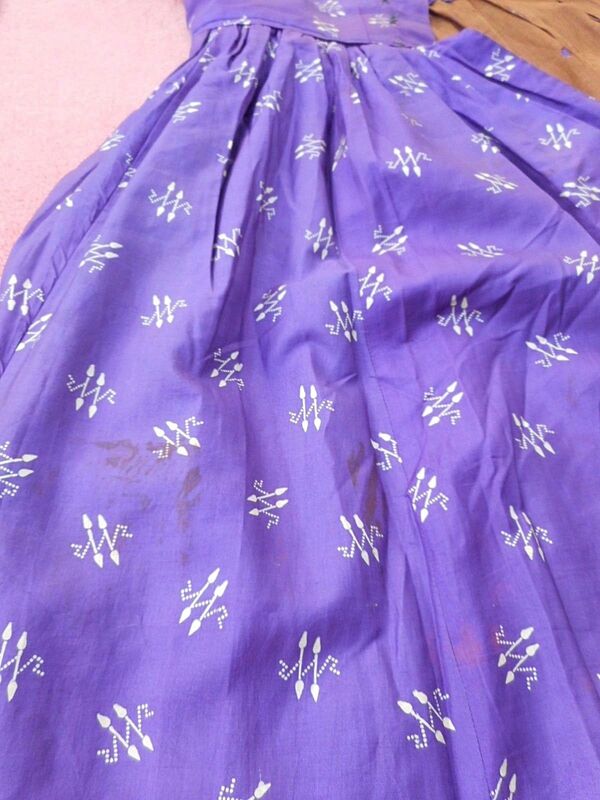 Overall the dress has a few pin size oxidation spots scattered about. 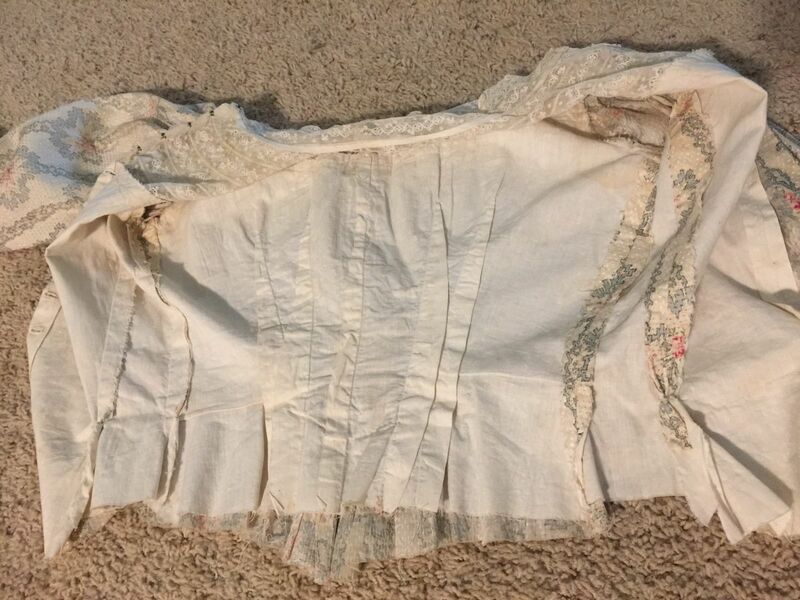 These will all soak out with its first soak. 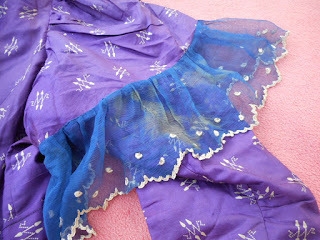 There is NO underarm discoloration. 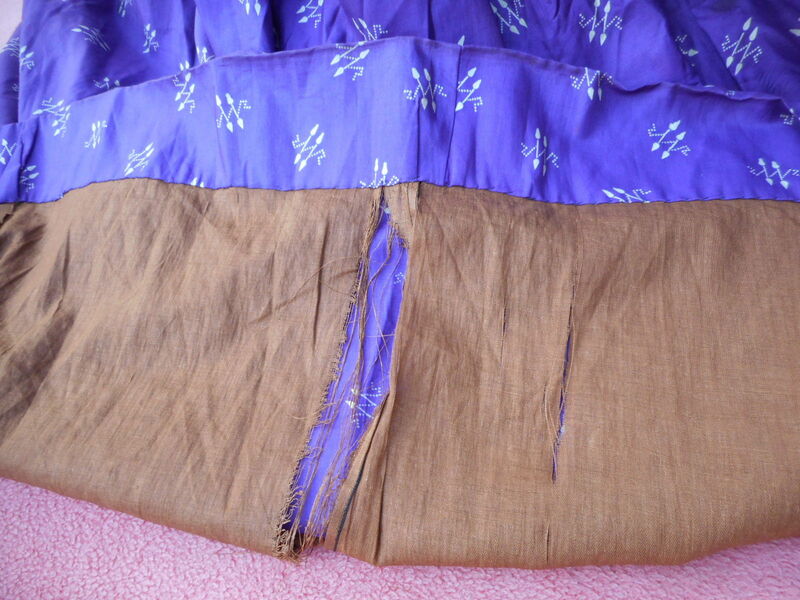 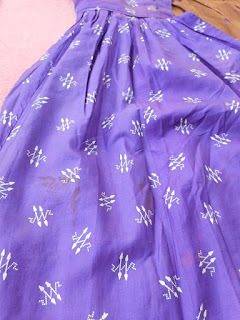 Silk lining is in poor shredding unstable condition. With some loose hook and eyes in back closure. 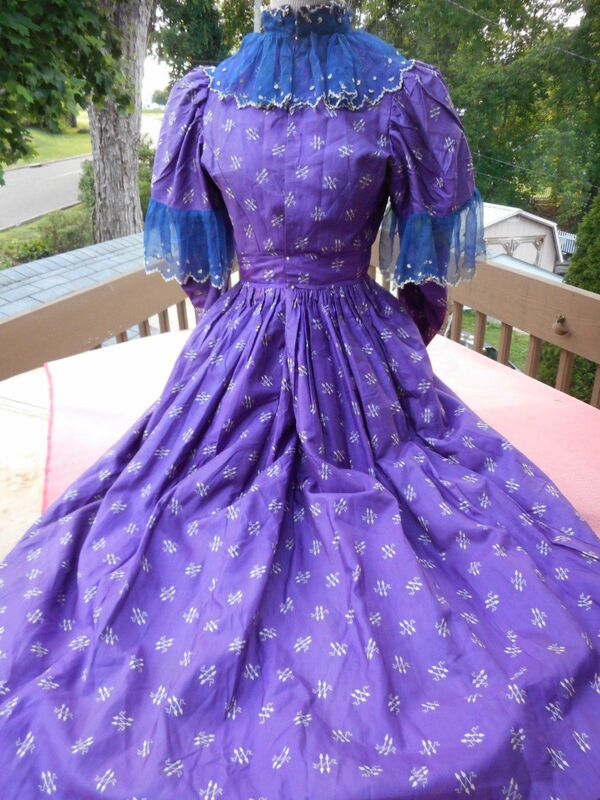 This dress has very few imperfections consistent with it's age. 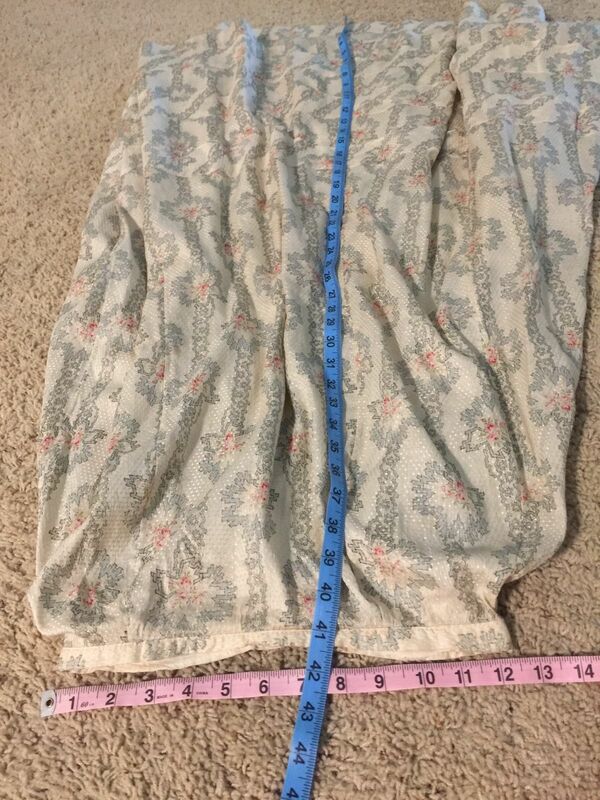 Front length from shoulder to hem 56", Back length from shoulder to hem 66", . 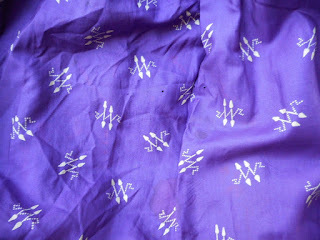 A lovely addition to one's collection. Would make a wonderful romantic wedding dress. 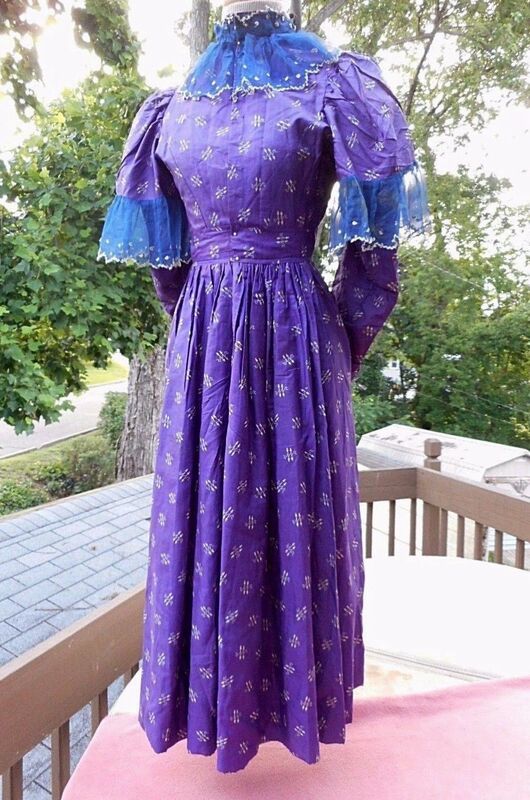 NoNoNoNoNo! We do not wear antique clothing unless you like destroying old things, ruining the possibilities of learning from them for future generations, and you like being pretty much in naked ruins in an hour. 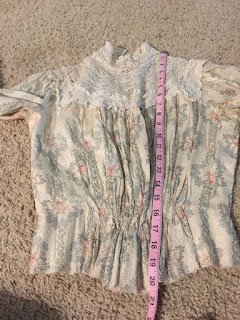 The rosettes threw me off on this dress - I believe they were placed there much later in the mid 20th c to cover up the spots; ie, they didn't cause the spots. 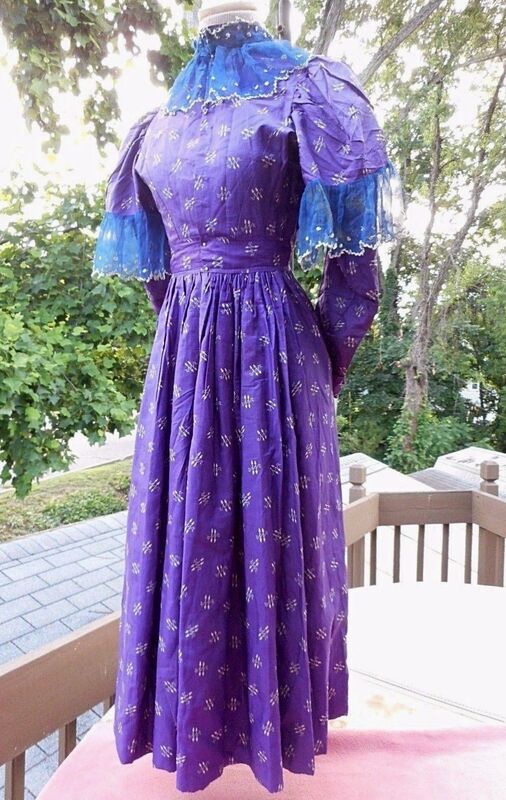 I almost thought it was a remake until I saw the back detail and realized that it was just the rosettes that had been placed on the dress, not the entire dress being constructed of older pieces later on. 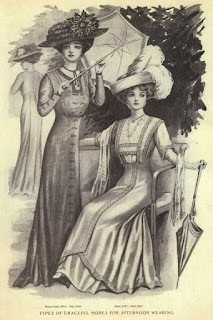 That being said, I do think this was an early Edwardian that was remade at the end of the Edwardian era to follow the latest fashions. 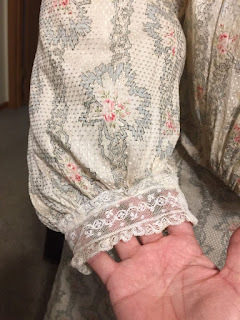 The sleeve puffs are just a bit too 1902/1903 versus the 1909 sleeves. 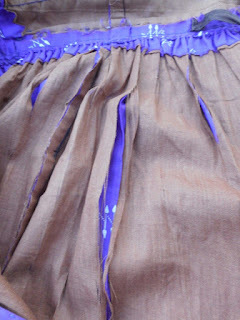 Being remade would also explain some of the weirdness of the trim not exactly meeting up. 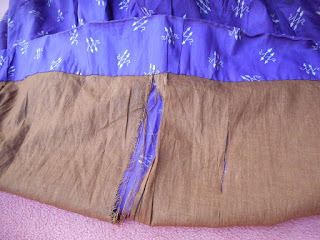 The skirt had a lot of it's fullness taken out. 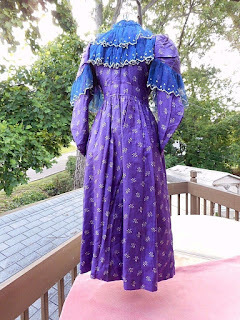 It also might have been remade for a teenager from one of her mom's old dresses. 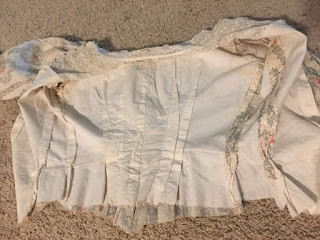 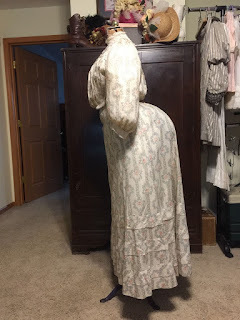 I have never seen a dress like it ** worth the TLC ! underarm-underarm: 17" waist: 14" length: 43"
The bust is 34" with a 28" waist - not bad! Given the overall length, I agree that this was for a teenager and not a grown woman. 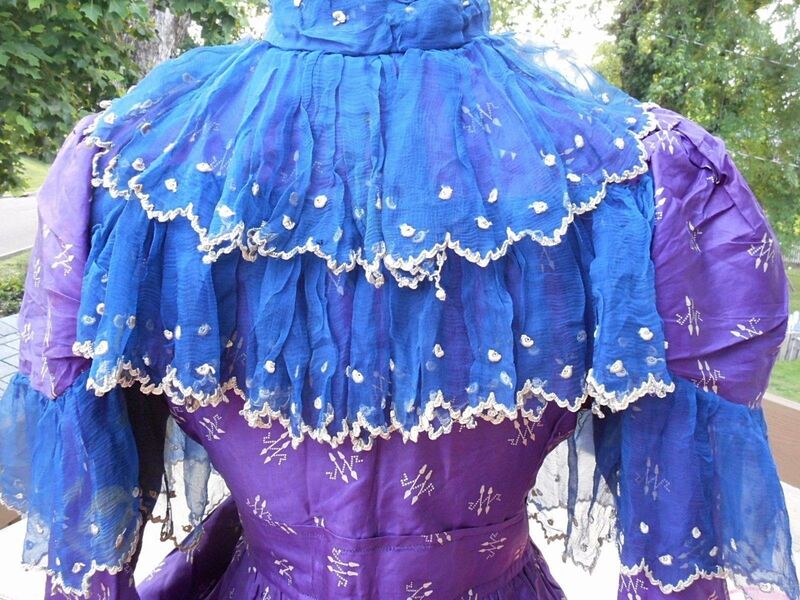 I absolutely adore the colors. 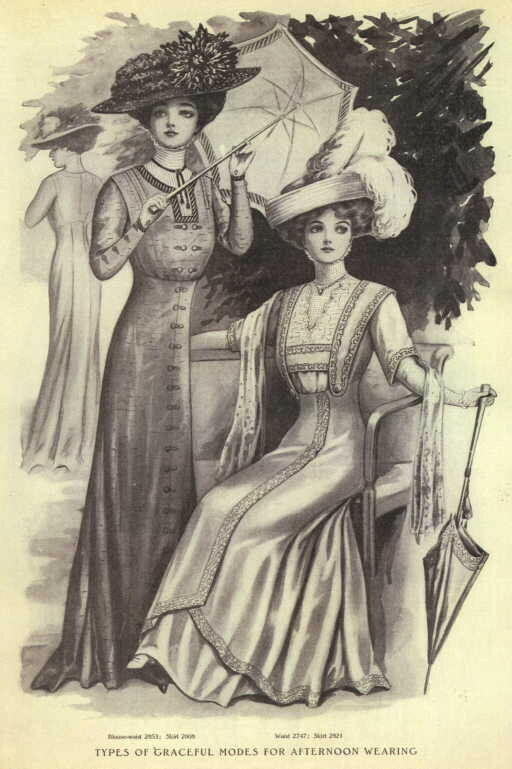 As for the decade, it's interesting. The dress looks like it was remade from a much older style. If you look at the inside upper collar, you can see the hand stitching pretty easily. 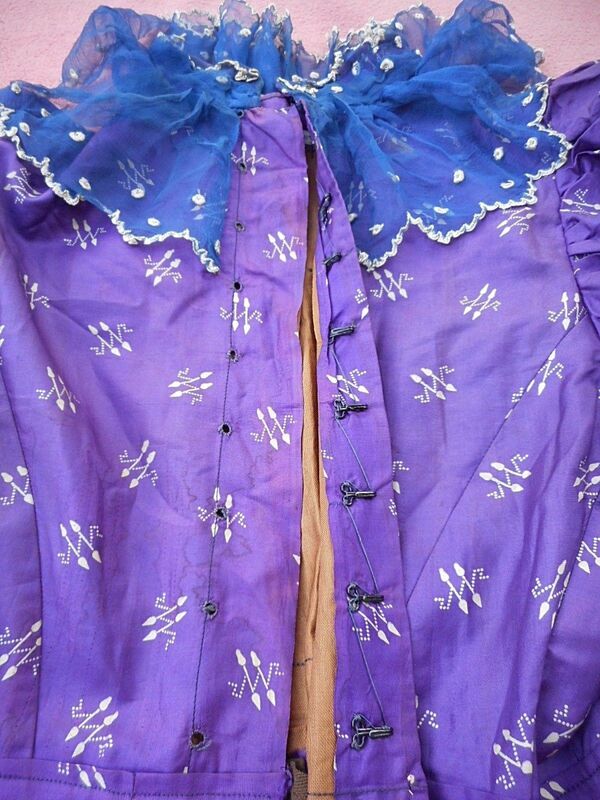 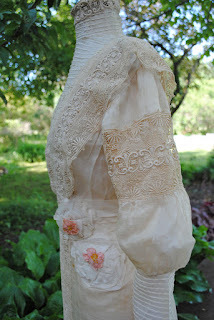 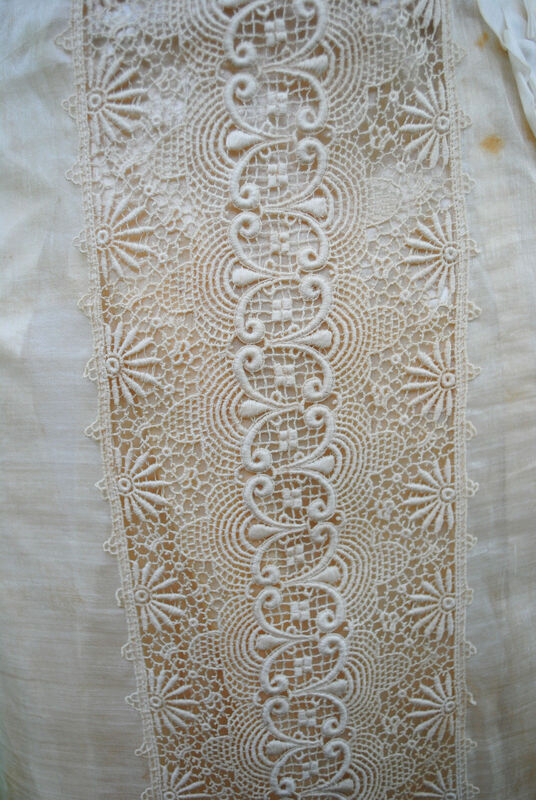 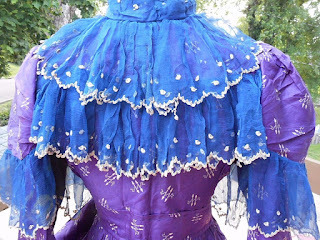 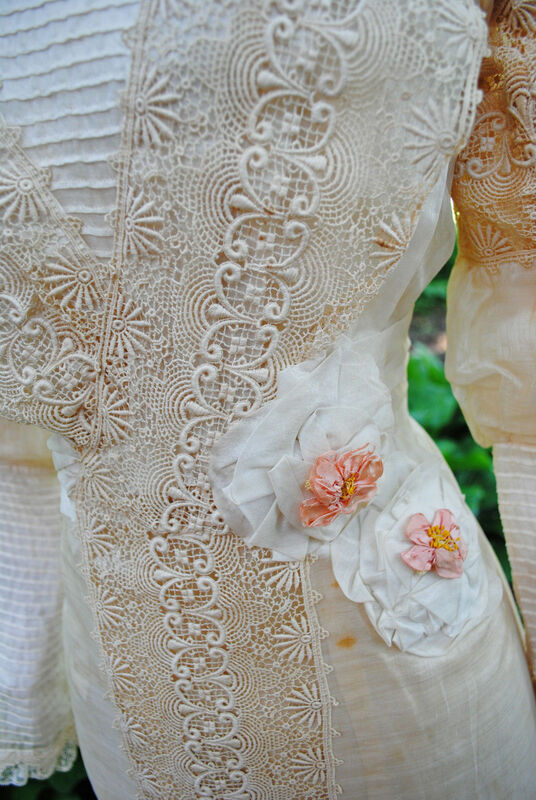 The sleeve style, once you take away the blue lace, is dead on for the 1830's. 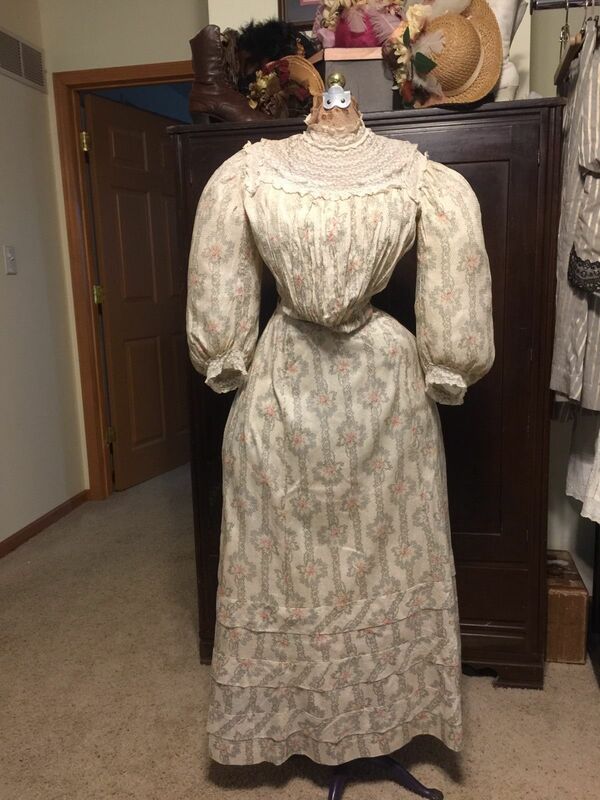 The waist seems more 1830's too. 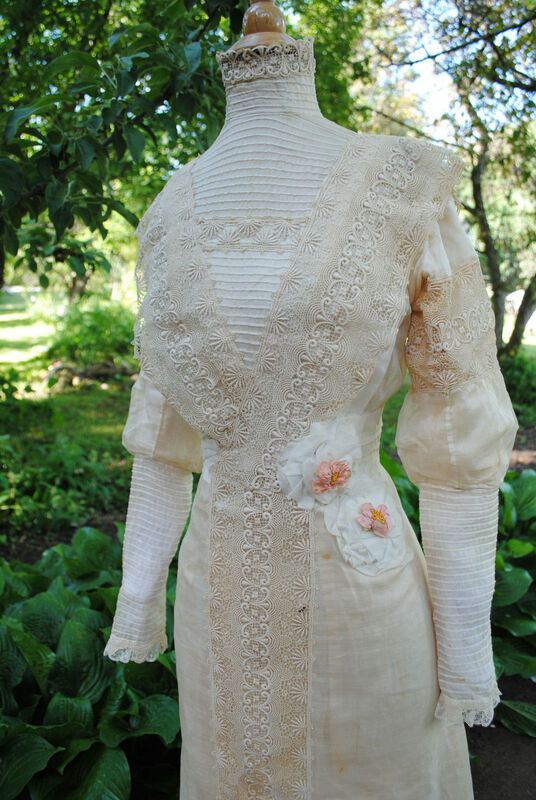 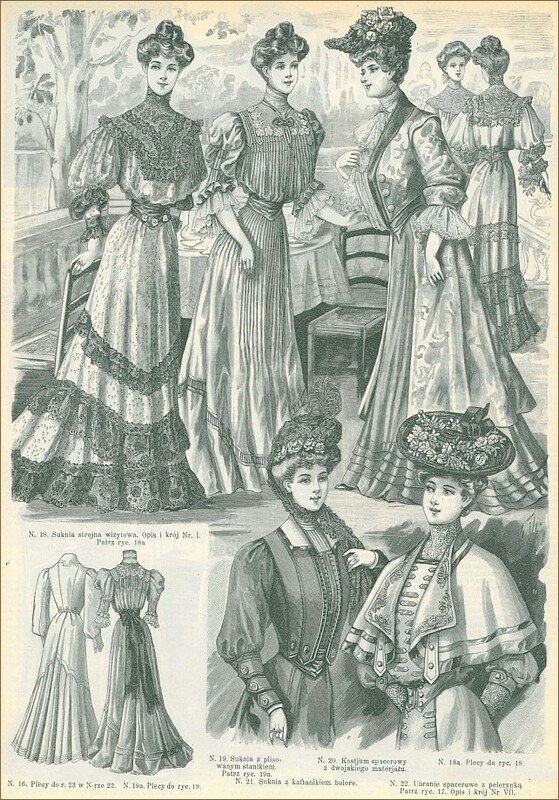 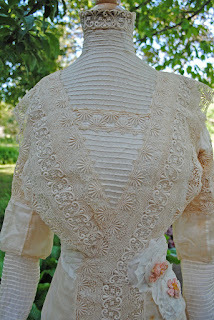 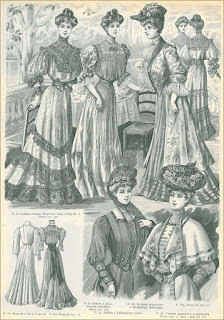 It's the addition of the lace and a few other changes that make it more late 1890's. 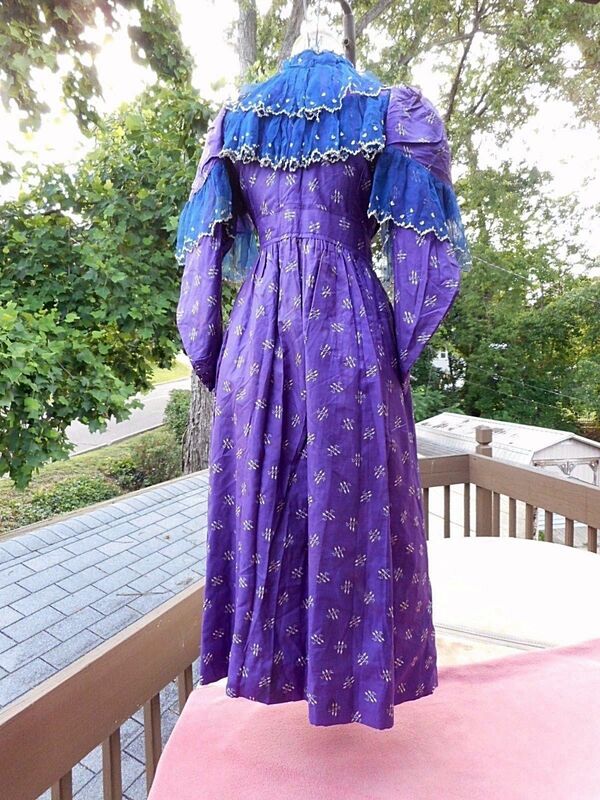 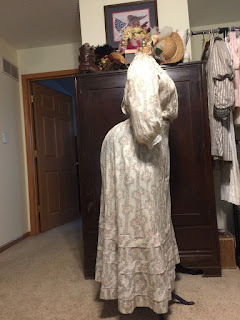 I can see a young girl taking her grandma's dress and remaking it for a party - think Anne of Green Gables taking one of Marilla and Matthew's Mom's dresses to remake with "puff" sleeves using left over lace from one of Diana's dresses. 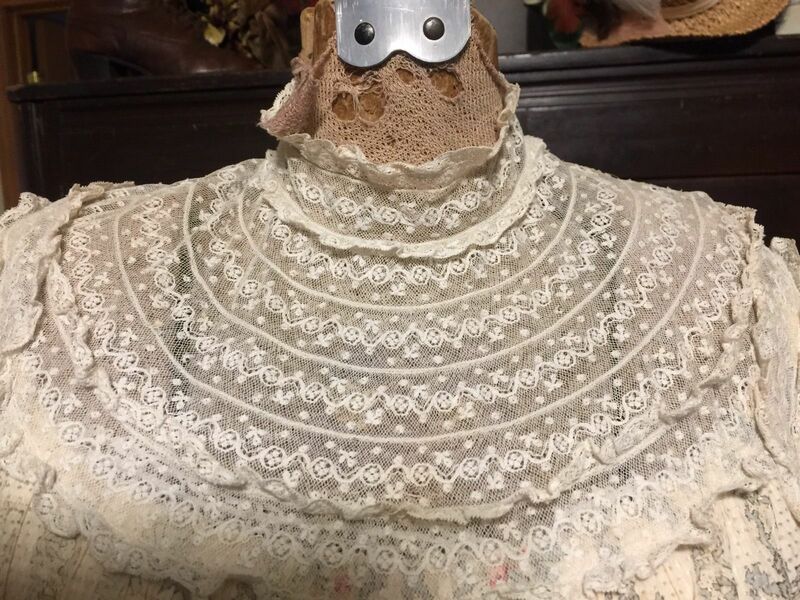 I'm thinking something more like this originally but with a higher neckline (like this one that someone in the 1890's added lace to and called it a day. 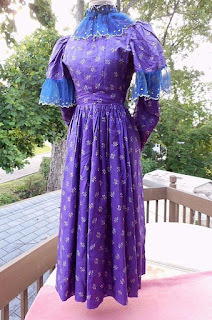 And yes, I'm back from Pennsic. ...However, I'm moving! 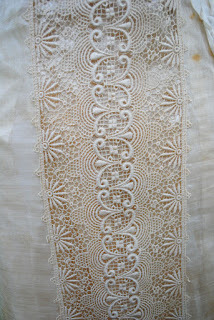 So, until the end of the year, things will be...hectic to say the least!